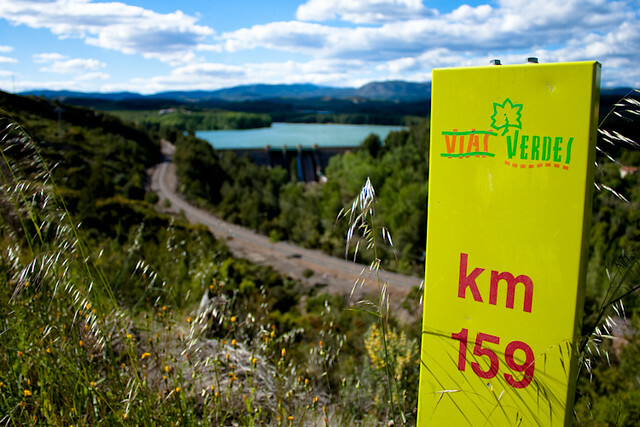 Spanish Green Ways (Vías Verdes) are old railway lines that have been recovered for use by walkers and cyclists. There are Green Ways all around the country and they are an environmentally friendly way to enjoy nature and discover secret and impressive landscapes. One of the most popular Green Way is in the province of Castellón and it’s called Ojos Negros (Black Eyes). There are 1,800 kilometres of Green Ways in Spain. The path is usually flat and even and the rails have been remouved so walking or ciclyng on them is easy for all ages. The Ojos Negros Green Way is 106 miles long, with 14 tunnels and 37 viaducts along the way. The route starts in the town of Barracas and ends in El Puerto de Sagunto, in the Mediterranean Coast. 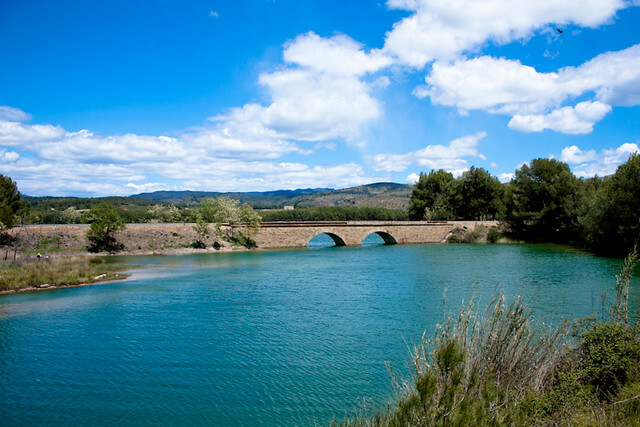 The best way to walk or to cycle the Ojos Negros is starting from Barracas and ending in El Puerto de Sagunto. You can see on the image above that it will be much more easier if you do it that way because you will be going from the highest to the lowest point of the route. To complete the whole route, specially if you do it by walking, you may need more than one day. There are several places where you can stop for a night, like campings, cottages or small hotels. Farmhouse: Masía del Ragudo and Fountain. Viaduct: Viaducto de la Fuensanta. Spring: Manantial de la Fuensanta. Viaduct: Viaducto sobre Río Palancia. Station: Antigua Estación de Jérica. Waterspout: Fuente de Los Baños. Waterfall: Cascada del Brazal/Salto de la Novia. Hermitage: Ermita de la Esperanza. The Ojos Negros Green Way is also known as the mine railway. It’s history starts more that 100 years ago. Here is some information about the history of the old railway. At the beginning of the 20th century a railway was built to join the mines of Ojos Negros in Teruel, where iron ore was extracted, and the Port of Sagunto. At first the ore was loaded onto the trains and exported from the port but, from 1923, the iron was used to supply Sagunto’s own furnaces at Altos Hornos. Construction of the line was started in 1902 and in 1907 the first shipment of ore was delivered. The Ojos Negros-Sagunto railway remained in use for seventy-five years, except for the period from 1933 to 1940, due to the high level of social and labour unrest at that time and the subsequent start of the civil war. Finally, in 1972, the train stopped making the journey and in 2002 the stretch of line between Barracas and Torres-Torres was opened as a green way, taking advantage of the way the original engineers at the beginning of the last century had respectfully integrated the railway line into the environment. To find out more about the Ojos Negros Green way, I recommend you to download the route «From Barracas to Sagunto» (PDF). Valencia: Top 3 places you can’t miss.